Baumer: With the expansion of the LX series by eight new models, Baumer combines the latest Sony Pregius sensors with the innovative, cost-effective 10 GigE interface. The global shutter LXT cameras with 3, 5, 9 and 12 megapixel resolution stand out by supreme image quality, a wide dynamic range of 71 dB and high frame rates of up to 216 fps. Capturing finest details even in highly dynamic applications at fast throughput, the CMOS cameras provide the basis for easy and reliable image evaluation with long-term stability. Series production begins in the 4th quarter of 2018. Thanks to exposure times down to 1 µs, these cameras are ideal in light-intense applications such as laser welding or in high speed tasks like pick-and-place to minimize blur. 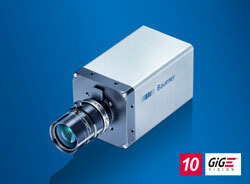 The LXT cameras feature 10 GigE interface for fast image transmission and reduced processing time. As a result, they are 10 times faster than GigE and 35 percent faster than Camera Link Full. In doing so, they ensure consistent data transmission at high bandwidth of 1.1 GB/s. In parallel, you are offered all benefits of the GigE Vision standard: widespread industrial availability, cable lengths up to 100 meters and easy cost-effective integration without the need for special frame grabbers and cables. Thanks to the water and dust-proof housing with IP 65/67 protection class and M12 connector, the cameras are well protected for use in harsh environments. The patented optional modular tube system with variable numbers of extension rings is the optimum protection for lenses of different length and diameter – to ensure quick and cost-effective camera integration with maximum flexibility without the need for an additional protective housing. Furthermore, the extended operating temperature range opens up multifaceted application opportunities with high demands on robustness of the components used, like inspections at overhead railway lines. Four opto-decoupled outputs with pulse width modulation and maximum output power of 120 W (48 V / 2.5 A) enable direct control of external lighting units and eliminate the need for external controllers, as required for example in 3D surface inspection with shape-from-shading. Now the LX series comprises 36 models with Dual GigE, Camera Link or 10 GigE interface and latest global shutter CMOS sensors by ams, ON Semiconductor and Sony. With resolutions up to 48 megapixels and frame rates of up to 337 fps, these cameras are the ideal choice for demanding inspection tasks with high demands both on detail accuracy and throughput.